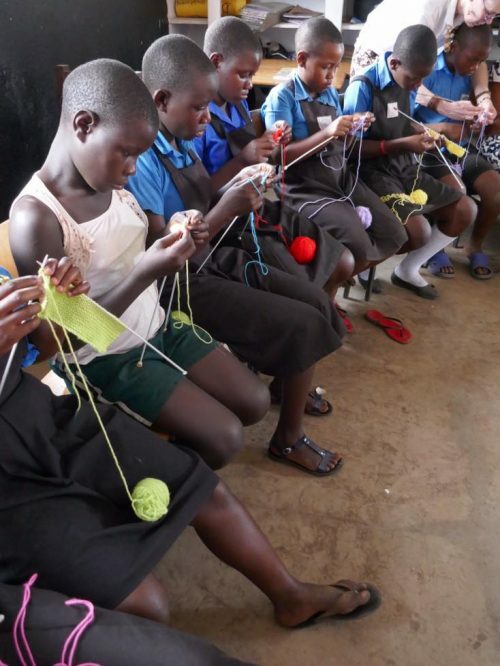 As an avid knitter since a child, having learnt to knit from my Mum, I couldn’t resist the chance to share my knowledge of the craft with the kids and teachers at Uphill. 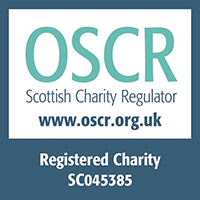 A request on Facebook at the end of 2018 led to donations of no longer used knitting needles and crochet hooks, many of which had been lurking, neglected, in the backs of folks’ cupboards. In addition a wonderful supply came from Mary-Rose Redlin and her American friends. I decided that knitting squares was probably the easiest to begin with. If successful, they could be sewn together to make blankets. Blankets are very necessary in Uganda as, though it sits on the equator, it often goes very cool at night. A blanket would be a useful addition to the school sick bay, too. 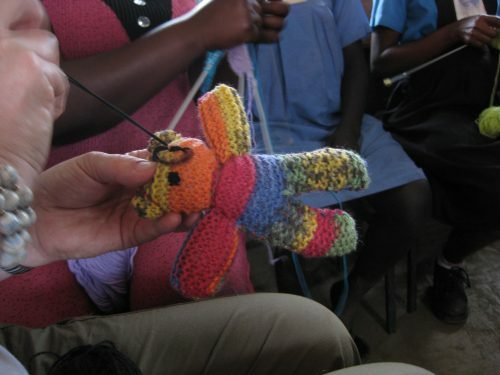 In reserve I had a simple teddy pattern which I thought would be easy to follow if we had any experienced knitters. Once in Uganda, as preparation for a group of new knitters, Blin and I sat in the guest house on a couple of evenings casting on lots of starter pieces. We discovered that hot sticky fingers were quite a problem but regular digit cooling round a glass of beer worked well. At the school, after a hot and busy day with some of the kids taking part in karate lessons, I gathered a group of kids and teachers all ready to give it a try. We had gender equality with some of the boys and a male teacher included. It was super to discover we had some experienced knitters including one of the P6 girls, our new school nurse Peace, and Madam Florence, the Head of Kindergarten. Though concentration and effort were very much in evidence, it was not long before a spot of sorting was required. Knit one, knot one, drop several, make lots of extra loops, and knitting so tight it wouldn’t move on the needles. I also had to work out how to do “continental knitting” which was an unpracticed technique for me – every day is a school day. However, after a couple of hours we had some quite successful efforts requiring only minor adjustments. The knitting was packed away for a few days by all except for Peace who, when not supervising the kids’ health matters, sat on the veranda with her needles on the go. 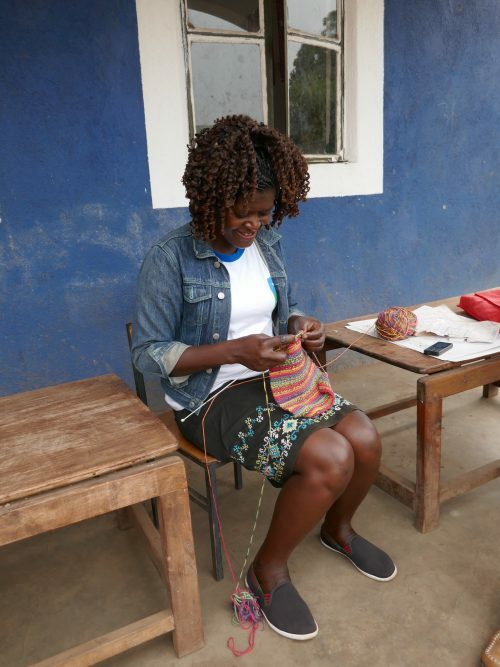 By the time we got to the second workshop she had made a little knitted bag with a crocheted handle to hold her ball of wool to stop it falling on the dusty floor. I immediately appointed her knitting monitor. After more good progress in another group knitting session, I was very happy to leave them with some instruction books and patterns in the capable hands of Peace and Madam Florence. Hopefully they will be able to carry on at school breaks and rainy playtimes. I can’t wait to go back to see if we have the Uphill blanket (or even blankets!) and perhaps a teddy or two. 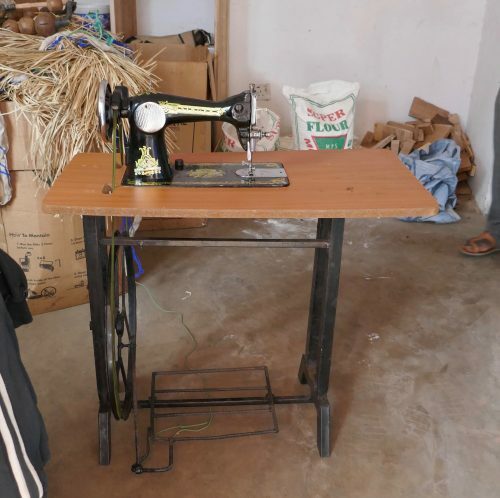 As an unexpected extra we were lucky to find three treadle sewing machines for sale from a local contact in Fort Portal. We snapped them up and took them to the school. These will be used by the school for sewing lessons. A further plan is to organise a training for the older girls and lady teachers to show them how to make washable, reusable fabric sanitary pads. It is so good to be able to add these skills to the school curriculum.